I'm going to be hosting a brunch for my best girlfriends at the end of this month, and the first thing that popped into my mind to make were waffles! I love a big fluffy waffle, but I never made them at home. Lucky for me, my mother-in-law had a brand new waffle iron sitting in her basement and handed it off to me! 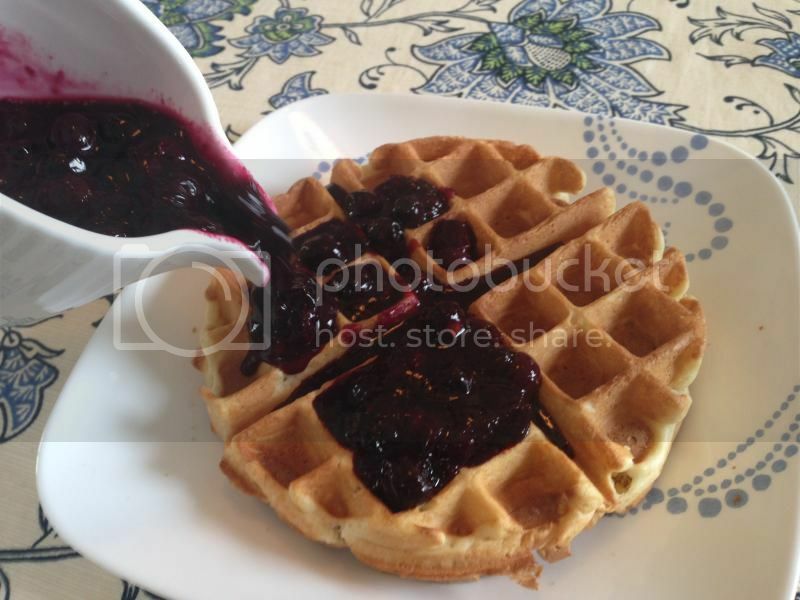 Saturday morning seemed like the perfect time to try it out for the first time, and I wanted to make a yummy fruit syrup to top off the crunchy waffle. I still have bags of blueberries in my freezer from our summer harvest, so I whipped up the easiest and most delicious warm blueberry syrup! Mix frozen blueberries and maple syrup in a heat-proof bowl. Microwave for 2 minutes, remove from microwave and mash berries with a fork. Microwave for another 2 to 3 minutes or until berries are popped open and have created a syrup. Eat warm or let cook before using.